A grey day is dreary and cool and can put you into a bit of a funk. So why would you want to bring that drizzly, damp color into your home? 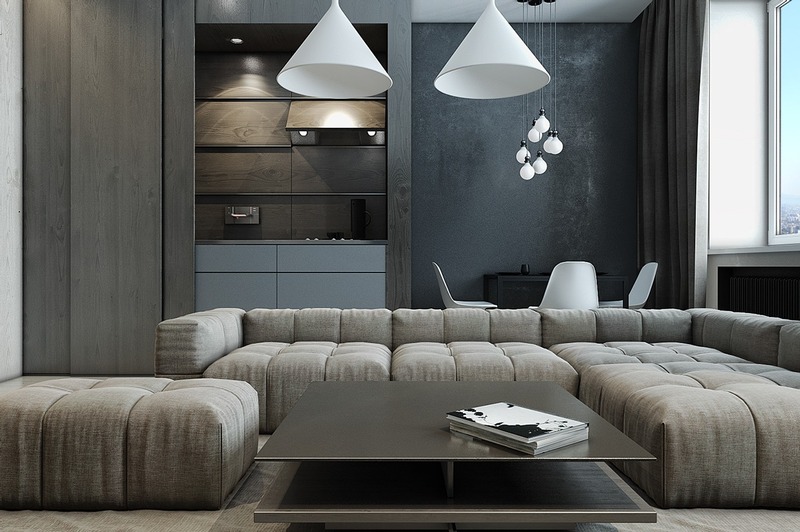 Because it can actually be a beautiful and seductive neutral. After all, it's no mistake that the hit book-turned-film 50 Shades of Grey uses the color right there in its title. There are so many different shades and textures that can really bring grey to life, letting an interior feel like a soft, comfortable embrace. 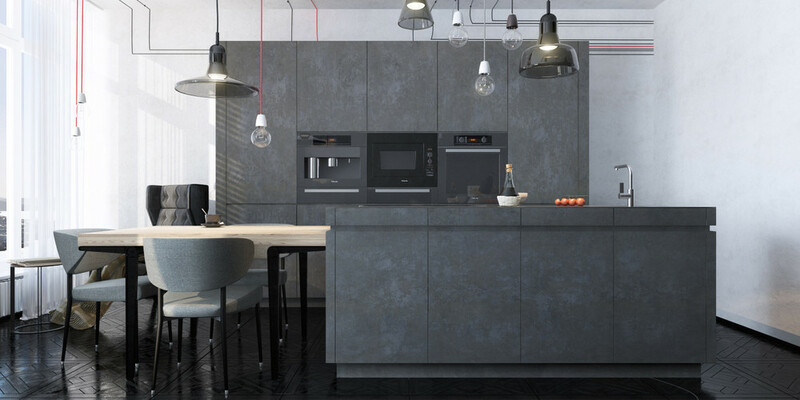 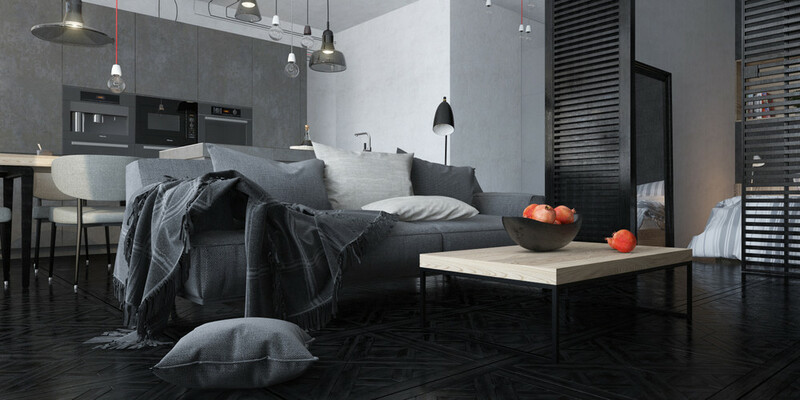 Take a look inside these five apartments that use grey as staple and you may just change your mind about this cloudy palette. 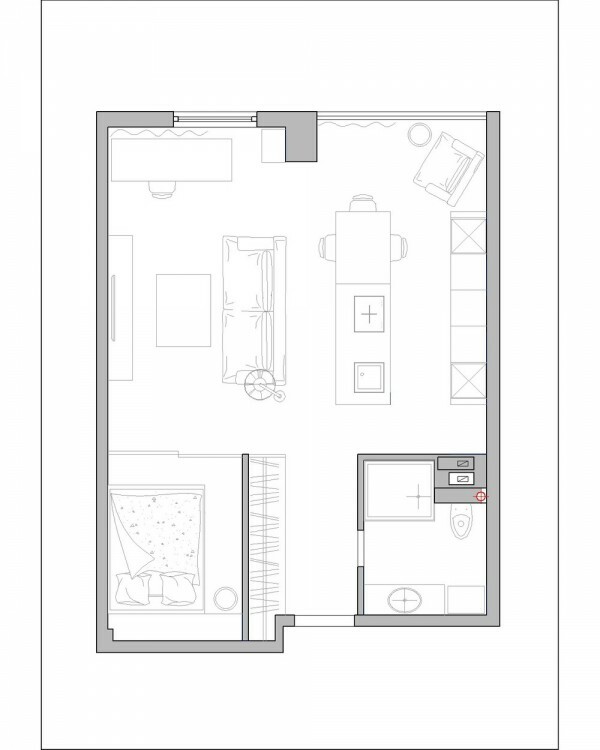 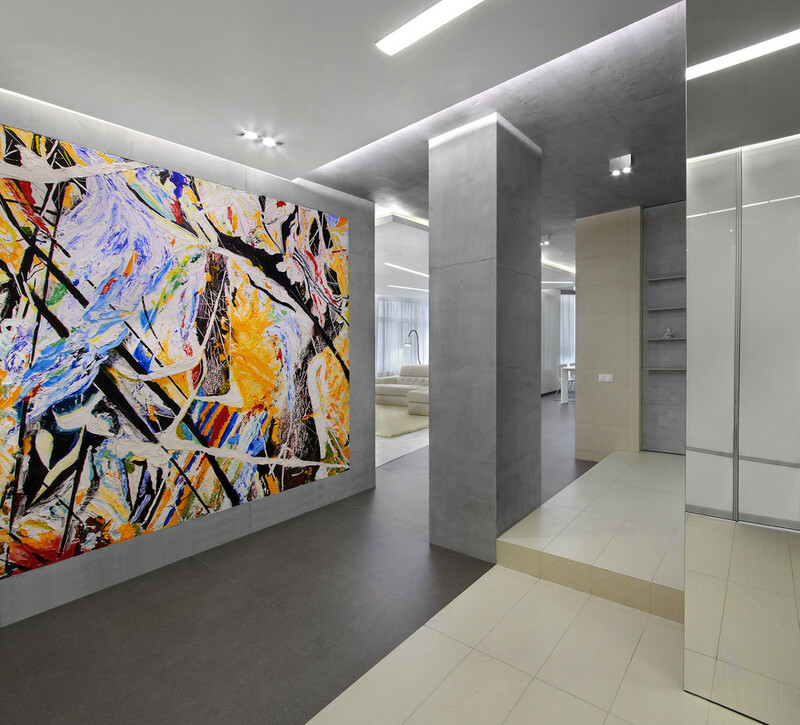 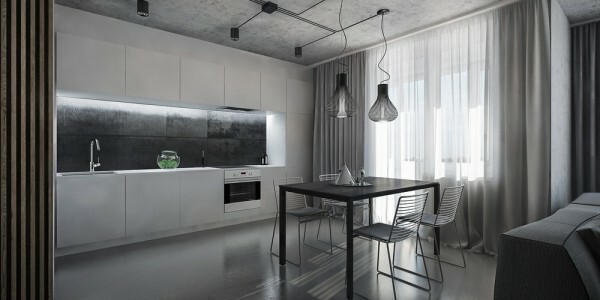 The first apartment comes from visualizer Eugene Buys and it is located in Malevich. 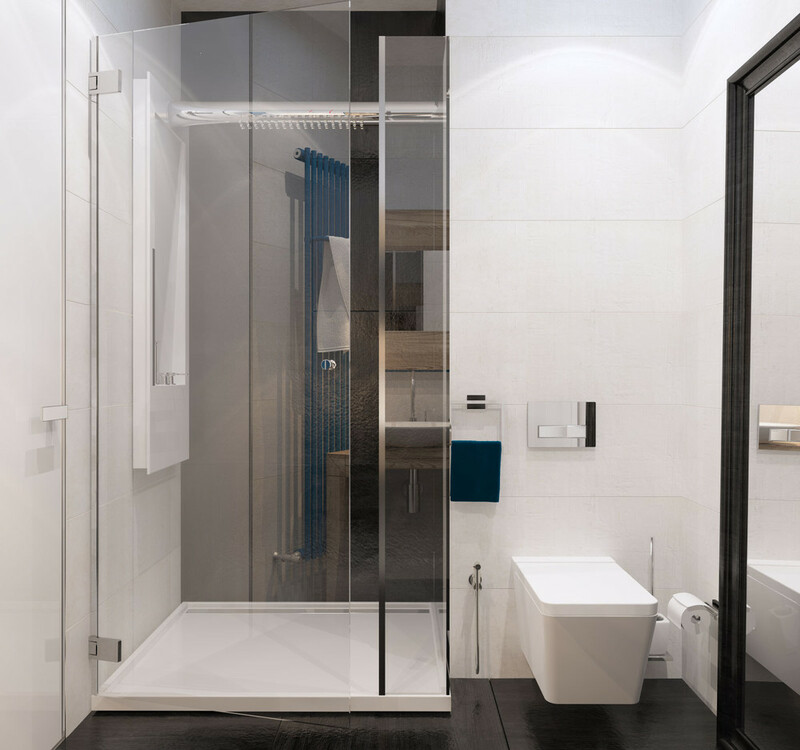 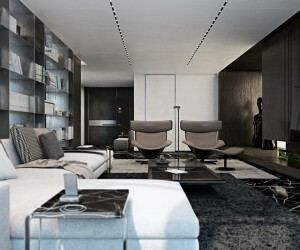 The space is designed for a young couple who strives to be modern and stylish. 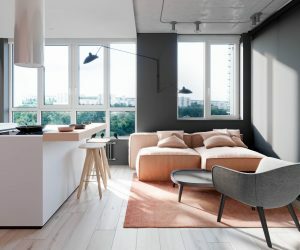 Though the interior takes few risks with color, it is still distinctly trendy without feeling like it will go out of style soon. 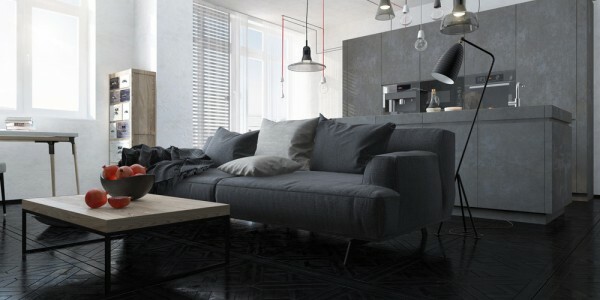 Dark grey walls ar coupled with light grey curtains and a large, medium grey sofa for the full spectrum of the shade. 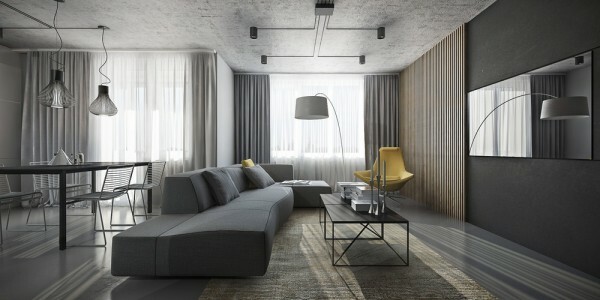 A few hints of sunny yellow serve to warm up the atmosphere just a bit. 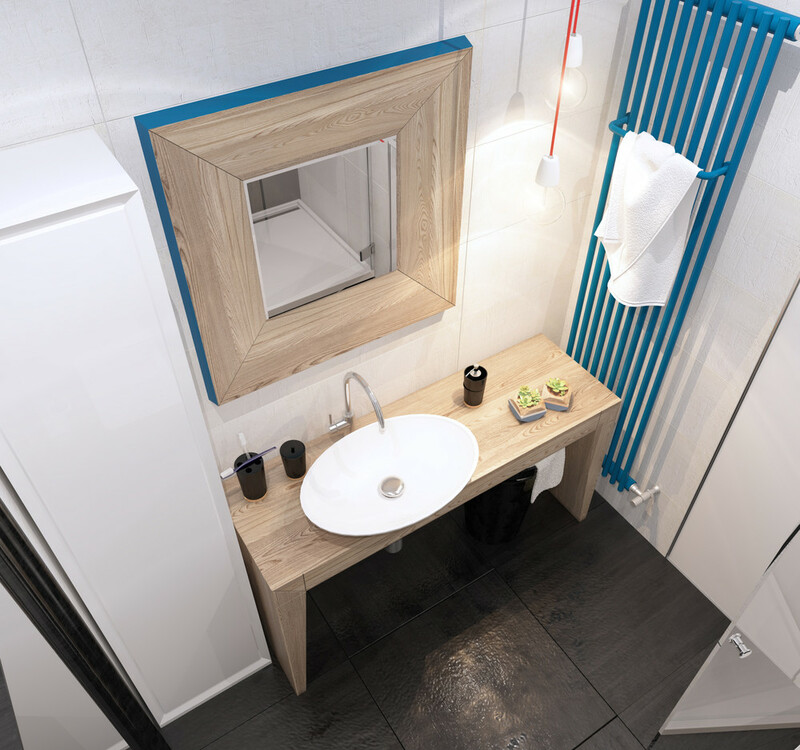 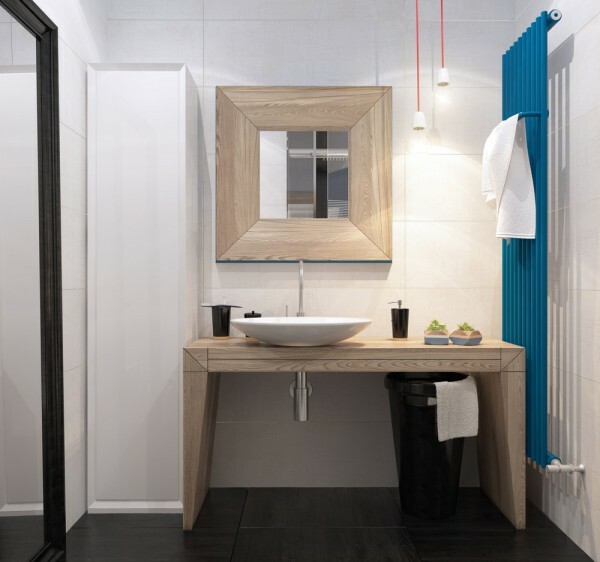 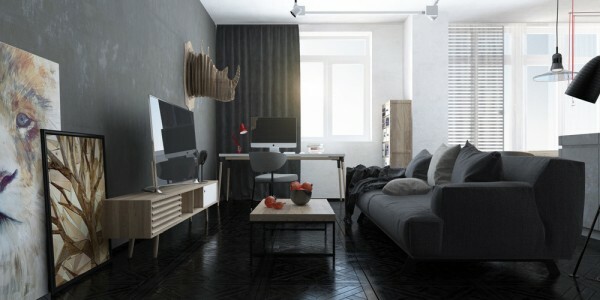 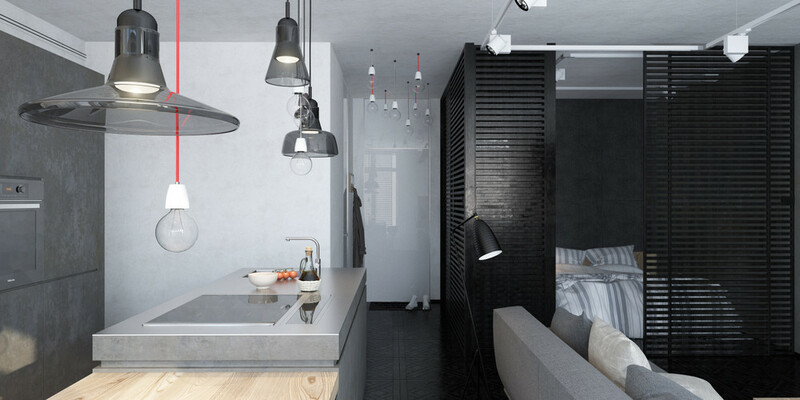 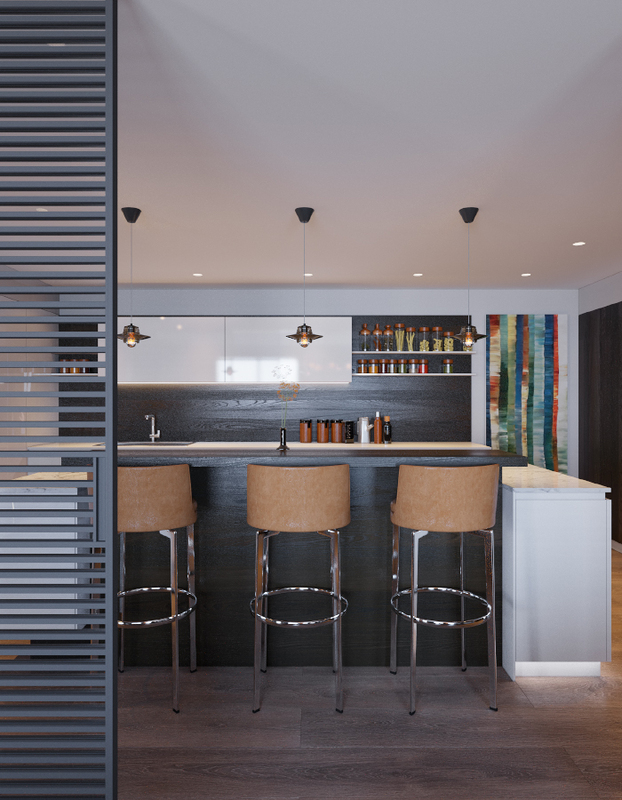 The second apartment is from visualizer Tatiana Shishkin and measure 48 square meters (just over 500 square feet). 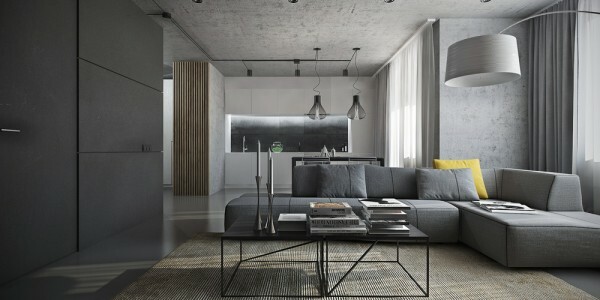 Again, the design is purposefully modern and fashionable. In keeping with this desire, the space is tastefully undone, meaning it includes unfinished concrete walls, bare light bulbs and hanging wires. 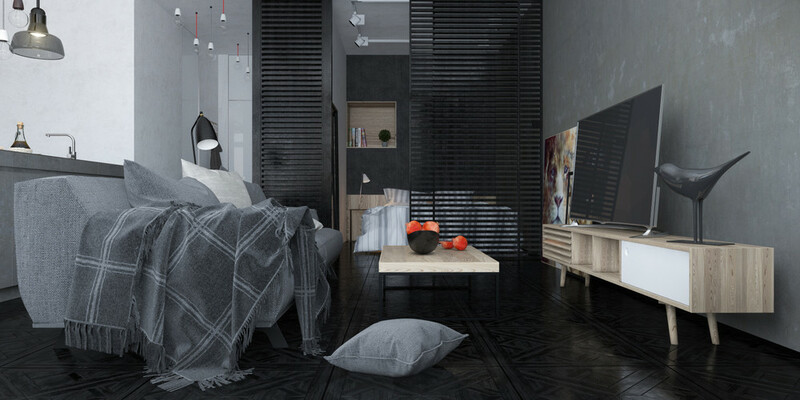 The small space is made more livable by the inclusion of sliding wood wall dividers, which keeps the bed feeling separate from the living area — but not completely. 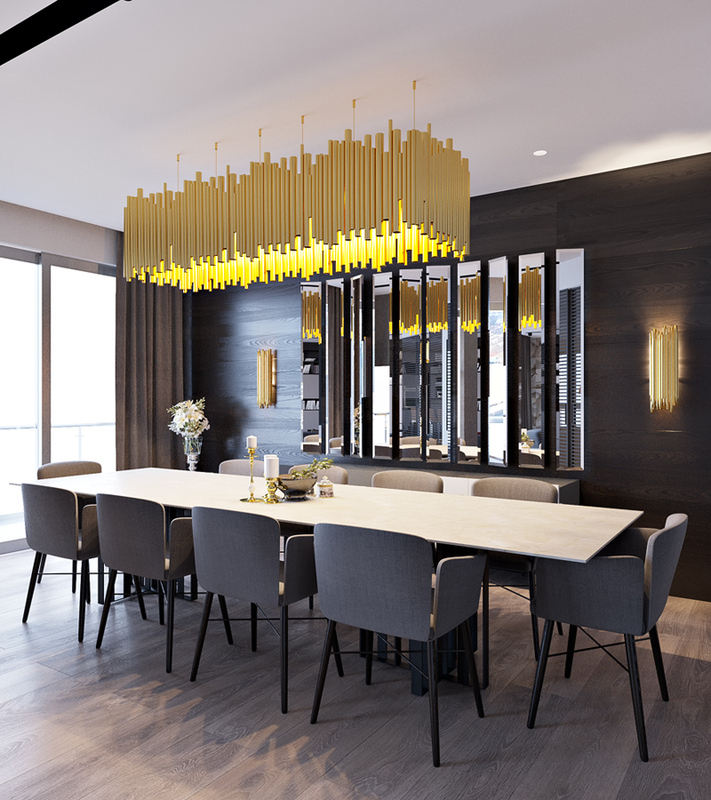 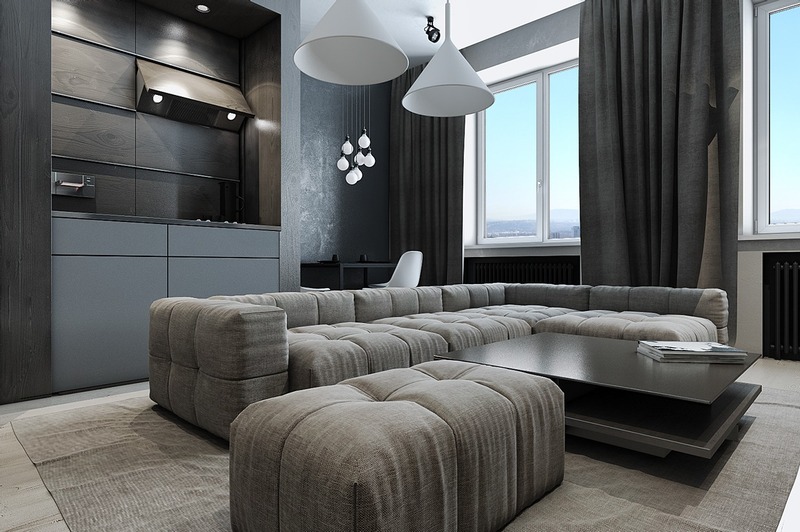 The third apartment is from designer Sergei Mansurov. 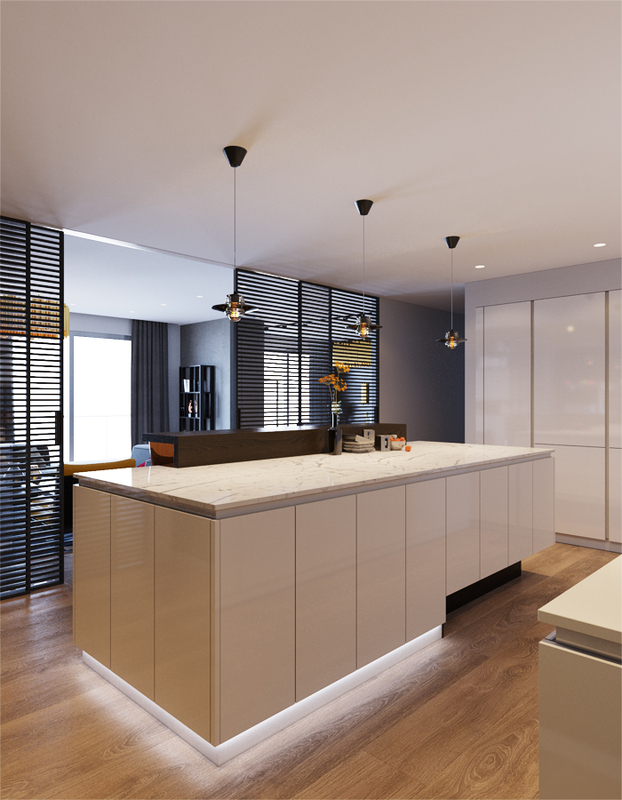 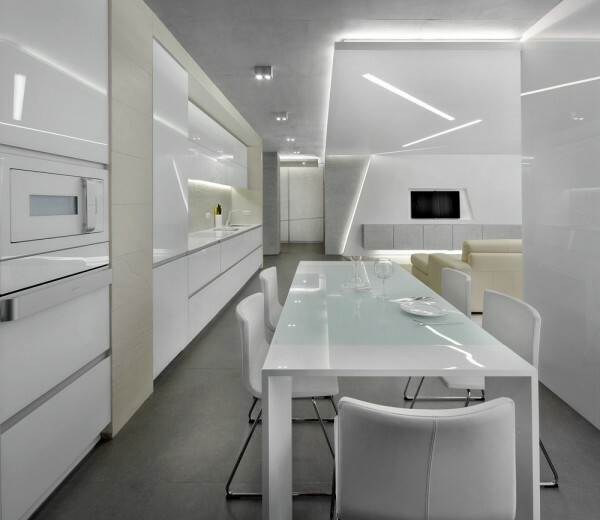 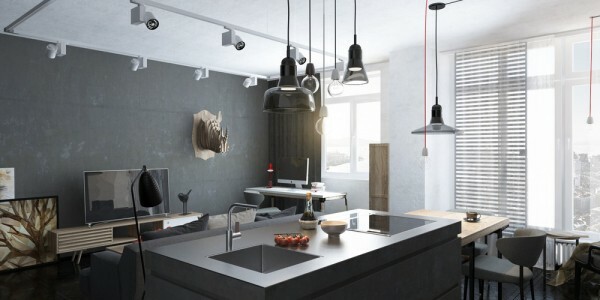 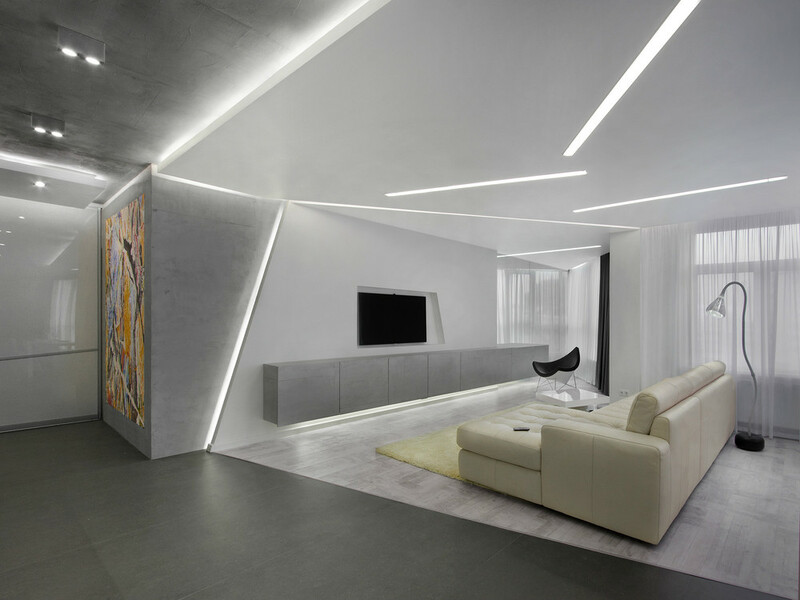 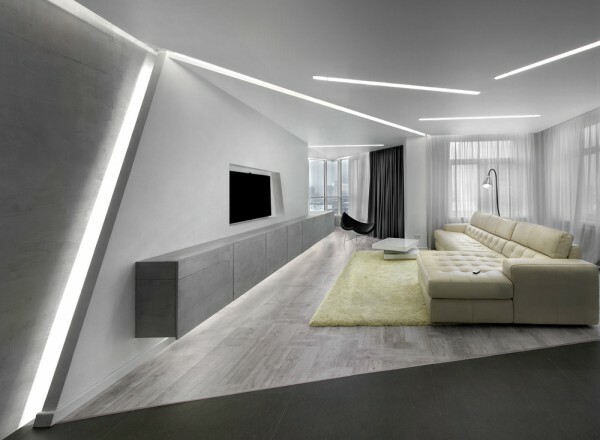 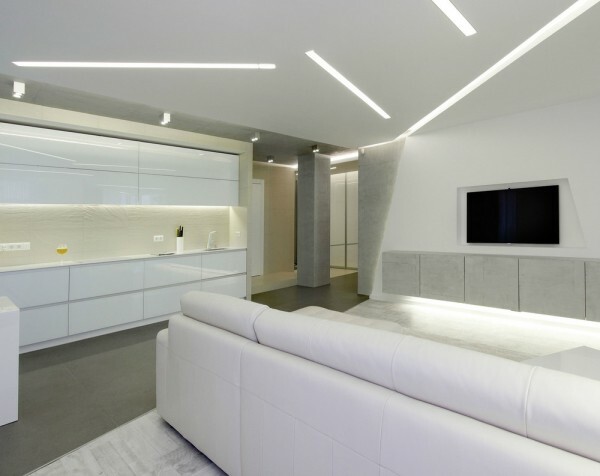 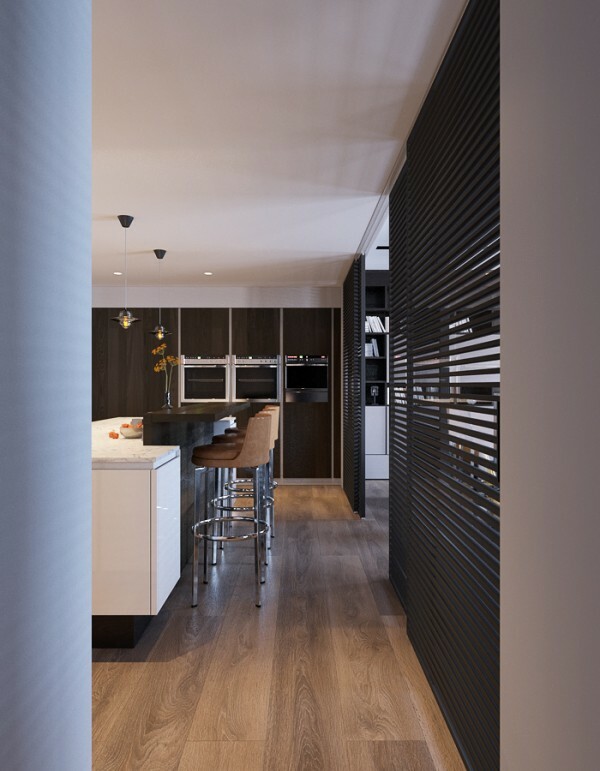 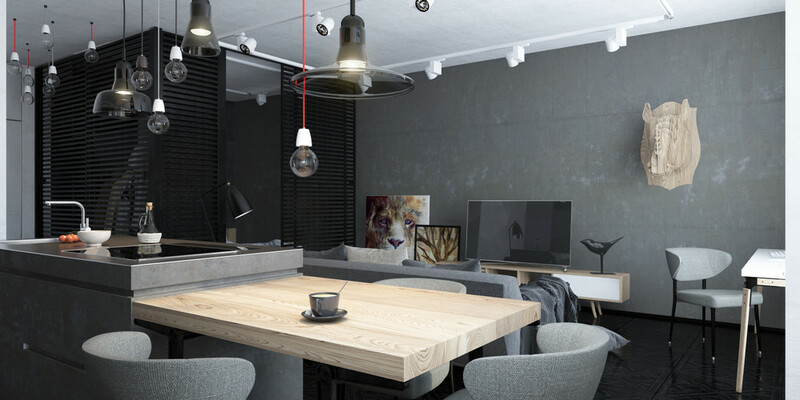 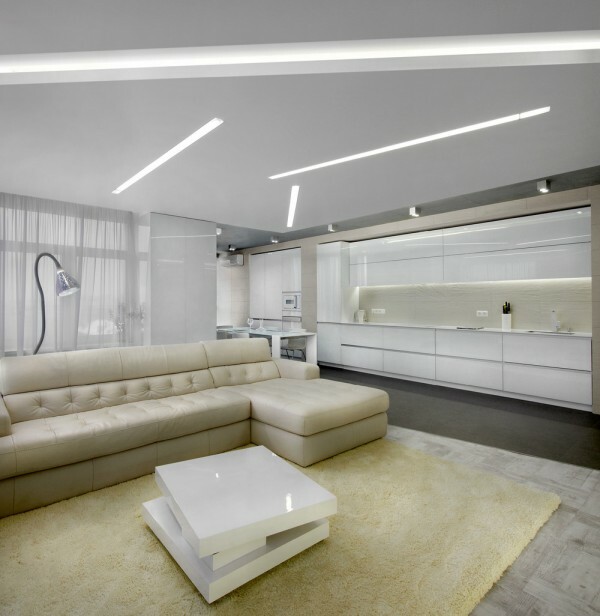 The lighting in this grey space is particularly notable as recessed shafts of light are scattered at surprising angles and create a kind of invisible light fixture. 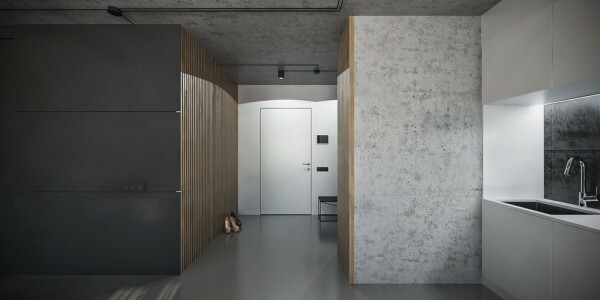 The soft gray walls and floors, made from concrete, are in keeping with the minimal style. 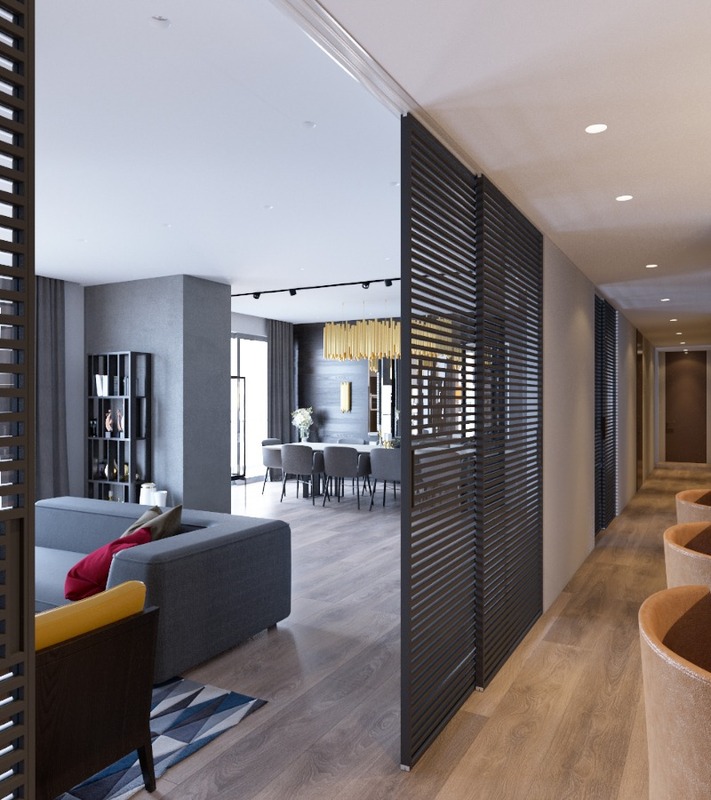 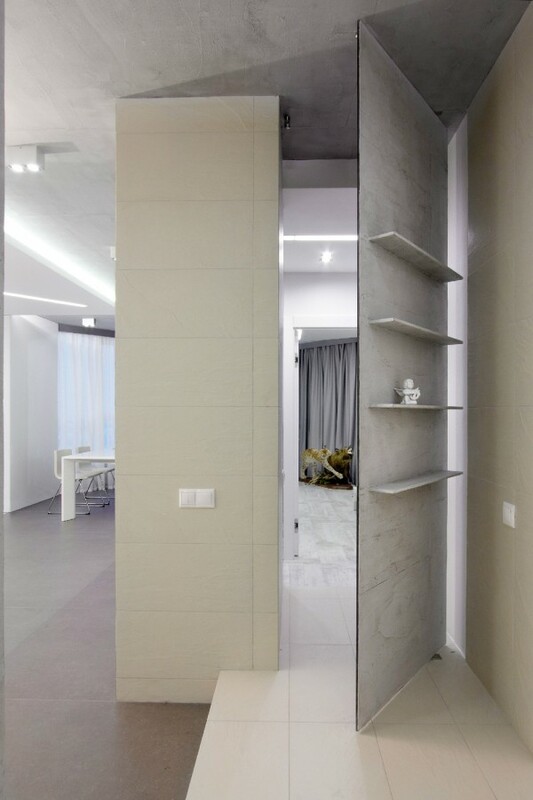 This stylish apartment also uses interesting architectural elements, particularly a secret door that keeps the private living areas separate from the entertaining spaces. 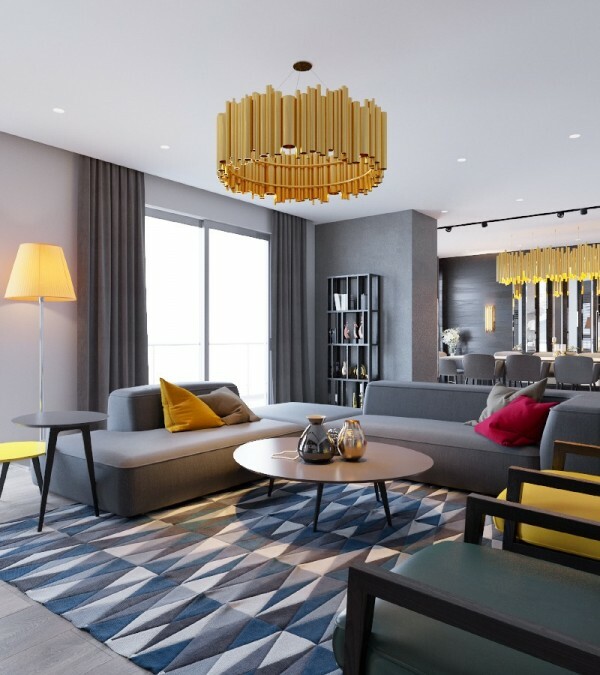 In the next apartment, from designers Elvin Aliyev and Leyla Ibrahimova, there is significantly more color than we’ve seen in the previous spaces. 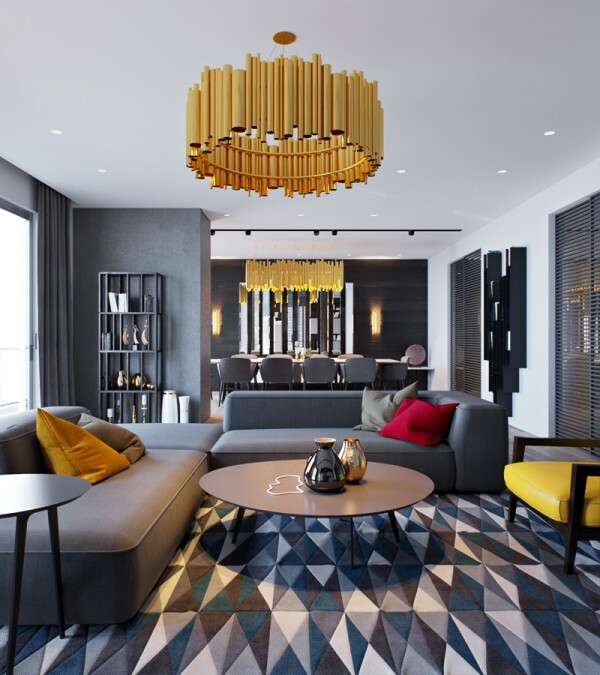 While grey is certainly the background, stunning gold chandeliers and colorful throw pillows brighten things up. 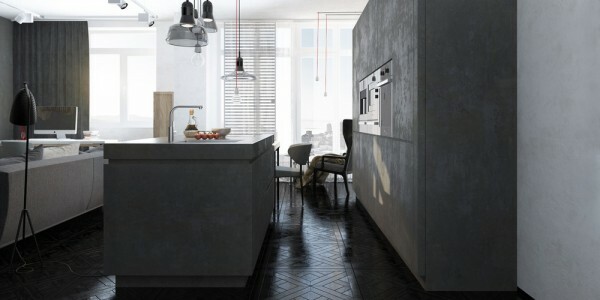 The natural wood floor even has a grey tint to it, but the addition of the wood grain (or is it grey-n?) 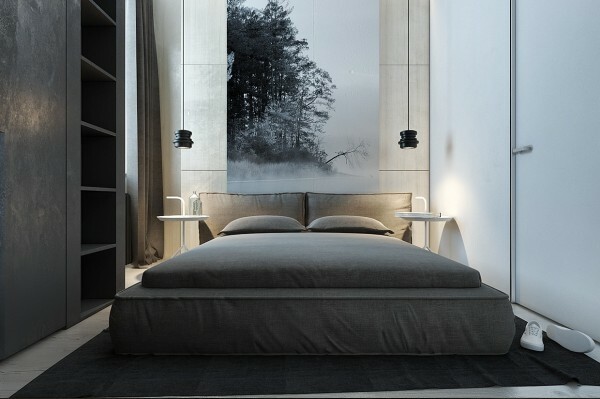 makes it feel much warmer. 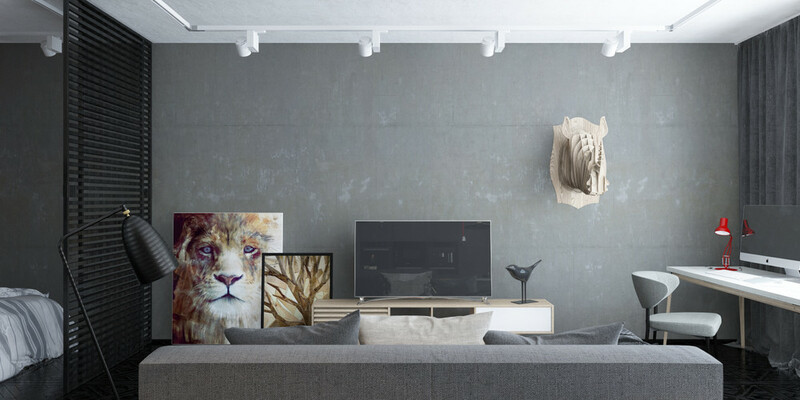 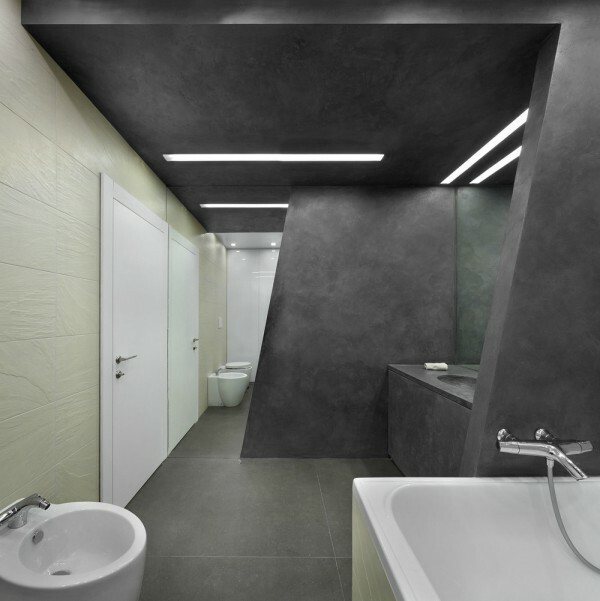 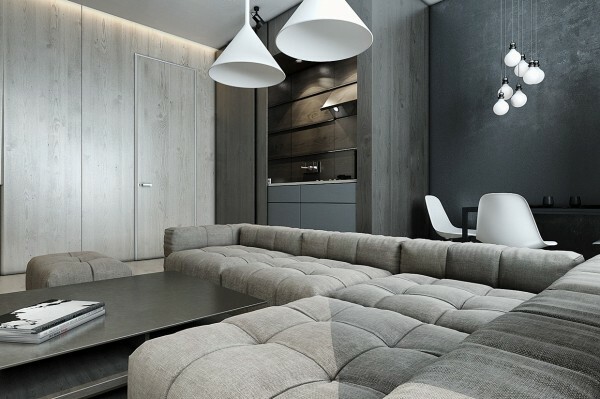 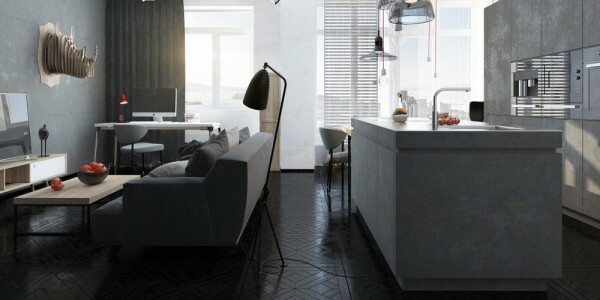 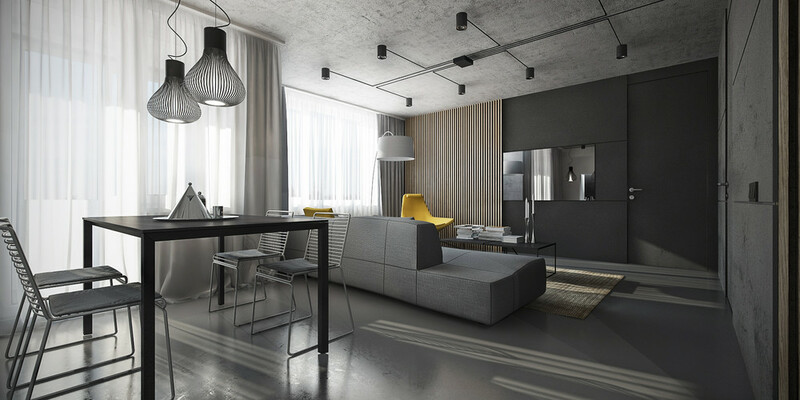 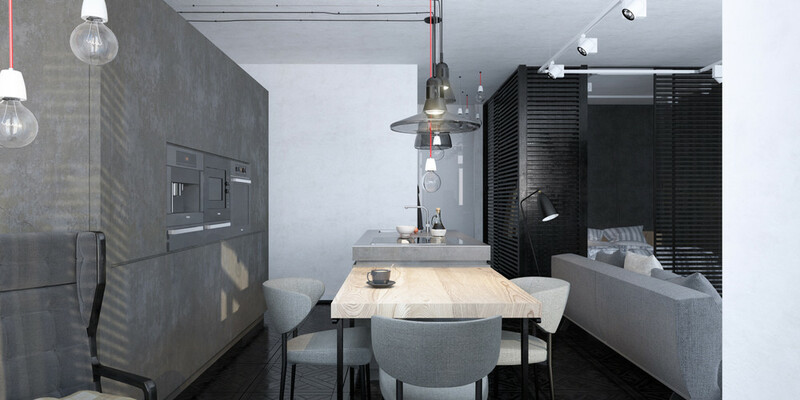 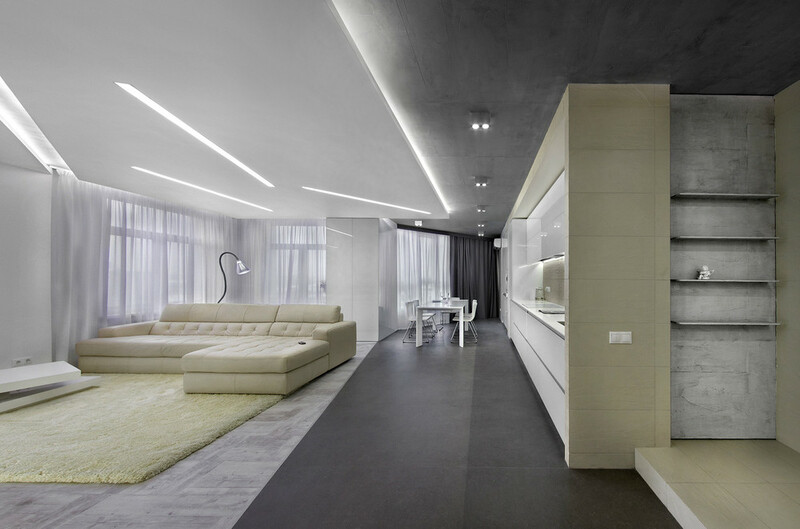 The final apartment from architect Stanislav Kaminski goes all in with the grey interior. 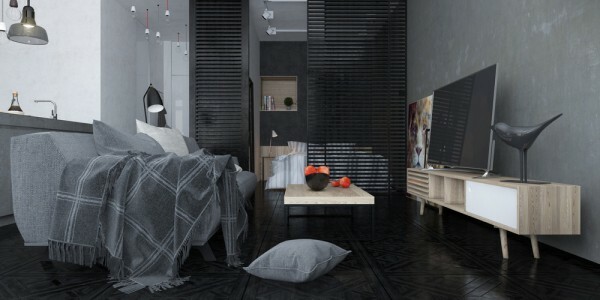 The result brings a lot of attention to the windows, which are the only source of color. Even the art in the bedroom is a grayscale image. 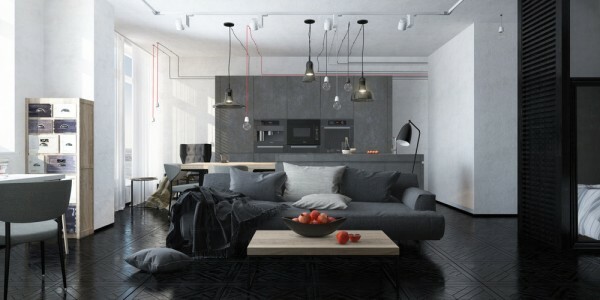 This is truly a home for someone who wants the only color in their home to be them.